Ivo van Hove’s production of Arthur Miller’s A View from the Bridge feels like the definitive production of the play. After experiencing its power, you won’t see how the play could be done any other way. Miller has modelled the play after Greek tragedy and van Hove follows this notion by stripping his production of of all the naturalistic paraphernalia that one might expect in an American play from 1955. Van Hove gives us the play at its simplest and most essential and in so doing has created the best production of a play by Miller you may ever see. The production premiered at the Young Vic in 2014. Van Hove seated the audience on three sides of Jan Versweyveld’s set to provide some approximation to the semicircular seating of an ancient amphitheatre. In its transfer to a proscenium theatre like Wyndham’s, van Hove has provided two ranks of seats on stage on either side of the set. Besides being and attempt to imitate an ancient structure, the onstage seating reinforces the idea built into the play that the characters cannot hide from their community. The community witnesses and judges everything its member do. In imitation of the valva regia of the scaenae frons of ancient Roman theatre, Versweyveld’s set features only one entrance through an overlarge door in the back wall. The playing area in from of this door is rectangular and surrounded by a low plexiglass wall with a rim that serves as a bench. The plexiglass again emphasizes the inability of the characters on stage to hide, even though the characters themselves are involved in concealment of every kind. When we enter, however, the playing area down to the plexiglass surround is covered by what looks like a cube of black granite. The action begins when this hollow cube rises to to reveal the players and ends when it descends to hide them again. With an audience on three sides this aspect of the set design at first suggests an exhibit being unveiled, an indeed it is. It is an example of ancient tragedy discovered in contemporary everyday life, that as a play is re-enacted at every performance. The fact that the walls of the hollow cube are so thick suggests that such precautions are necessary because the force the exhibit will unleash is so powerful. All this follows from the first speech of the lawyer Alfieri (Michael Gould) who serves as the chorus and narrator to this tragedy: “In some Caesar’s year, in Calabria perhaps or on the cliff at Syracuse, another lawyer, quite differently dressed, heard the same complaint and sat there as powerless as I, and watched it run its bloody course”. All the actora are barefoot when they are inside the playing area. Alfieri wears shoes outside it but takes them off when he enters it and plays his role as lawyer. Catherine considers wearing shoes with heels once, but is chiding for it by her uncle Eddie and never wears shoes again. Shoes are most fundamentally a form of protection and in the play Van Hove implies through this aspect of dress that no one in the play is protected – that all are vulnerable. The uncomplicated story is set among the Italian-American longshoremen in the Red Hook area of Brooklyn. Eddie Carbone (Mark Strong), a longshoreman, lives with his wife Beatrice (Nicola Walker) and his orphaned niece Catherine (Phoebe Fox). Catherine is 17 but around Eddie acts as if she were still just a little girl. That’s exactly the way Eddie wants her to be, so when she states that she wants to take a job he strenuously objects. Beatrice, in contrast, tires to encourage Catherine to grown up and make choices for herself rather than always caving in to what Eddie wants. From Catherine’s first entrance when she leaps into Eddie’s arms, arms around his neck, legs around his waist, Van Hove allows us to suspect that Eddie’s interest in Catherine, now that she is an adult, is not a healthy one. Things are exacerbated by the arrival of two of Beatrice’s cousins, Marco (Emun Elliott) and Rodolfo (Luke Norris), as illegal immigrants from Sicily. Families in Red Hook routinely sheltered “submarines”, or family members working illegally in the US to support relatives back home. Marco is married with a wife and children back home and that is his plan, but the single Rodolfo reveals that he hopes to stay in the US. Inevitably, Catherine and Rodolfo start going out together, first just as friends then as lovers. This infuriates Eddies, first because Catherine’s attention has turned from him, and second because Eddie is convinced that Rodolfo’s unmanly ways mean that he is gay and thus only using Catherine as a way to gain legal status. Twice Eddie consults Alfieri, who tells him there is absolutely nothing from a legal point of view that Eddie can do, especially when the couple announce they want to get married. Eddie’s only recourse would be to inform the authorities that there are illegal immigrants in his house, but informing on family is viewed in Red Hook as in Sicily as one of the worst possible crimes. Alfieri informs us that he sees exactly where the story is heading but that rational advice is unable to sway a man like Eddie who is acting out of passion. The play is beautifully directed. Van Hove has the tension mount slowly but inexorably until you are so held in its grip you hardly dare breath. The effect is utterly devastating. Van Hove has not imposed a concept on the play as so many directors do, but has rather exposed the basic, powerful structure that informs it and has stripped away all incidentals so that that structure works on us with the greatest immediacy. Not only is the set entirely bare, but the play’s two acts are presented without intermission so that once the journey begins you must stay with it until the end. Van Hove has also divested the play of unnecessary characters, such as Eddie’s other co-worker Mike, another couple in the area, two other “submarines” and a cast of “Neighbours”. There is no need of “neighbours” because Van Hove has forced the audience to take that role. The cast is uniformly excellent. Their American accents are so perfect that only by reading their credits in the programme would you know they were all British or Irish. Van Hove has made on of many good decisions in having Marco and Rodolfo speak just like everybody else, rather than burdening them with phoney Italian accents. Again, Van Hove’s impulse is to focus our attention on the essential not the incidental. Strong gives a fantastic performance as Eddie. He is physically imposing and shows us how gradually but inevitably Eddie’s anger and frustration build until there is no option but explosion. Unlike Euripides’ Phaedra, who was only too aware of her sin in loving her stepson Hippolytus, Eddie, as an exemplar of traditional masculinity, is unreflective. One reason that Strong’s performance is so powerful is that he shows how a gradual perception of his obsession dimly occurs to him that he strives to shut out. Nicola Walker gives a great performance as Beatrice, continually under stress in walking a fine line between trying to tell Eddie the truth and trying not to provoke his anger. Walker’s Beatrice is only too aware of what is going on but is constantly debating inwardly about how she can bring her knowledge into the open. Phoebe Fox clearly shows how Catherine is torn between her love for Eddie and her desire for her own life. Luke Norris’s Rodolfo is open, easy-going and unreflective, just as he should be. In contrast, Emun Elliott’s Marco generates an increasing intensity as he sees how unjustly Eddie treats his friend Rodolfo. When Eddie teaches Rodolfo to box and accidentally on purpose slugs him in the stomach, Marco challenges Eddie to lift up a chair over his head by one leg with one hand. Elliott accomplishes this feat but along with it conveys such anger and menace toward Eddie that it takes our breath away. Michael Gould is an ideal Alfieri. World-weariness and profound sadness imbue his objective narrative with an emotion that resonates throughout the action. Ivo Van Hove’s production of this play is one that all future productions will be judged by. After seeing A View from the Bridge stripped down to is overpowering essence, it is impossible to imagine it staged in any other way. 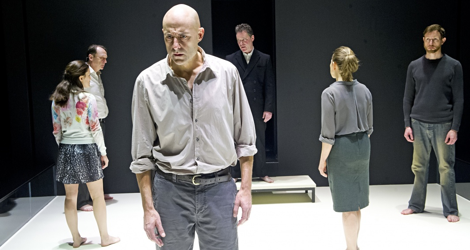 Photos: (from top) Cast of A View from the Bridge with Mark Strong (centre), ©2015 Tristram Kenton; Phoebe Fox, Mark Strong and Nicola Walker. ©2014 Jan Versweyveld.